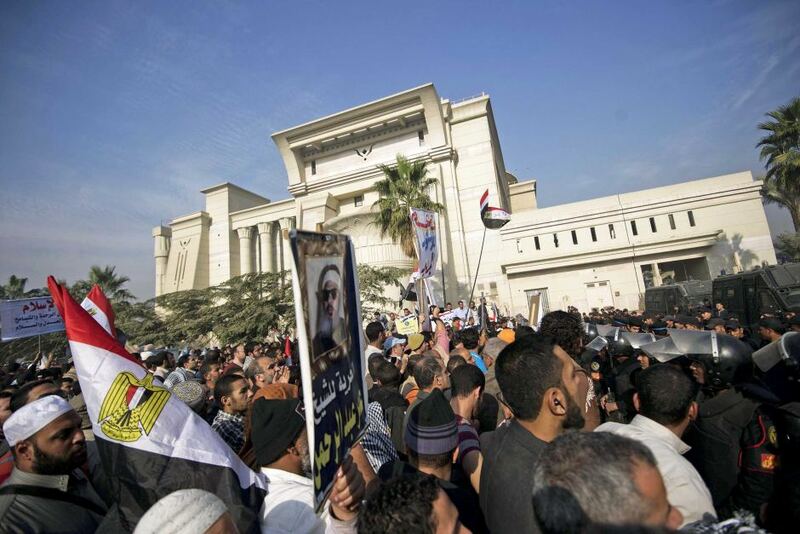 The Supreme Constitutional Court, under protest by Islamists, December, 2012. The Egyptian transition following the 2011 January 25th revolution has been fraught with controversy; among many has been the reform of the judiciary system. While the 1971 constitution guaranteed an independent judiciary, the following year President Sadat presided over the passing of law 46 which moved many judicial proceedings – including appointments, transfers, and inspections – to the executive branch through oversight of the Ministry of Justice. President Mubarak continued use of these privileges to ensure a regime-friendly judiciary. Though the reform of the judiciary was not chief among the primary demands of the revolution, many reformist judges had long been seeking to expose these executive abuses. The tensions came to the fore during the transitional period, as the judiciary became a battleground between the revolutionary popular will and what was interpreted as pro-regime rulings from the court. The first guarantee [of judicial independence] is for security of tenure. Judges must understand their position is safe, not subject to removal for rulings issued against the government. Second, the judge and court system as a whole must enjoy financial security. All necessary resources must be made available for the smooth functioning of justice. Third, there must be sufficient guarantees for individuals in the justice system. A culture of rights ensures the public demand for judicial independence, making it more difficult for the government to infringe upon it. Unfortunately, Binnie noted, the current Egyptian arrangement does not lend itself to judicial independence. First, the body tasked with inspecting judges is within the executive Ministry of Justice. This allows the executive branch to offer rewards to compliant judges – such as promotions or post-retirement ambassadorships – while penalizing judges who buck the system by assigning them judgeships in remote locations. Second, there is a threat to the independence of the judiciary if there is not sufficient public confidence in the system. Binnie noted that even if independence is achieved, the courts can operate as an ‘old boy’s network’, appointing from their own circles rather than drawing from the diversity of society. The presence of women is particularly helpful, he noted, but a comment from the audience helped demonstrate his point. Egypt boasts only 42 women judges, but 39 of these are the daughters of established judges. Third, the presence of a parallel court system undermines judicial independence. Even the best system will fail, Binnie noted, if the government can simply bypass it. With separate jurisdictions for military, security, and emergency courts – each able to try civilians – Egyptian justice suffers. Binnie noted that some drafts of the coming constitution do not sufficient guarantee rights during periods of national emergency, threatening to perpetuate the current system into the post-revolutionary era. The constitution limited the use of military courts, but it did not eliminate their jurisdiction of civilians. Still, this has not been a practical issue since the end of direct military rule. Noting the importance of public confidence, it is at an all time low. Islamists have none at all, while non-Islamist revolution supporters still see it as in service of the regime in concept, if in particularity the identity of the regime is still under contention. Meanwhile, courts across the country issue rulings that send advocates of human rights up in arms. In Egypt, moving from an autocratic tradition, enshrinement in the constitution is necessary. This must be done in detail, lest the situation resemble Russia where vagueness in wording has allowed erosion of judicial independence. Experts expect it may take years to reverse Russia’s political culture of judges as servants of the executive branch. A positive example could perhaps be taken from the experience of Bosnia. Political leaders took the decision to sack all judges, and then require them to reapply for their positions in competition with new applicants. In the end, 70% of judges were reinstated, but two significant results were produced. First, this measure resulted in a great sense of public confidence in the governing system. Second, the judges themselves ‘bought into’ the new program from the necessity of keeping their jobs. It also reset their orientation, as most judges everywhere, Lund believes, desire independence. As with much of the state infrastructure, bold reforms are necessary, but political conditions do not permit the unity needed for orchestration. It is a shame polarization has reached such a point. Please click here to read the whole article on Arab West Report. « Is Coptic Evangelism in Africa Really on the Rise?